RR: Welcome everyone. Please introduce yourself and your work. EL: Aaniin. My name is Elizabeth LaPensee. 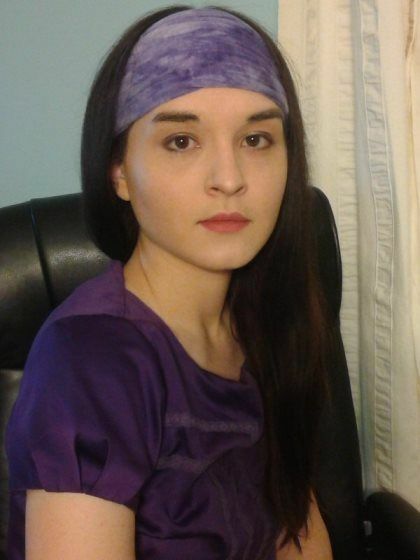 I am Anishinaabe, Metis, and Irish. I pretty much do all of the things, but mostly I’m a designer, writer, and artist in games, comics, and animation. You can see highlights at http://www.elizabethlapensee.com/. JJ: Halito! I’m Johnnie Jae, an Indigenerd belonging to the Otoe-Missouria and Choctaw Tribes of Oklahoma. 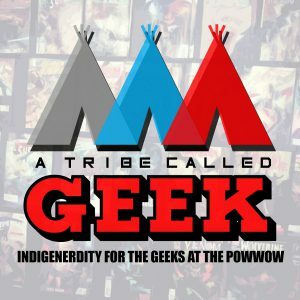 I’m the founder of A Tribe Called Geek and I co-host our namesake podcast. I’m a multimedia journalist for Native Max Magazine and I contribute to other publications like Native News Online and Complex Magazine. I produce and host/co-host several other podcasts as well: Indigenous Flame, commUNITYTalks and SNAG’N. I’m also a co-founding board member of Not Your Mascots and LiveIndigenousOK. Most of the work that I do is centered around Indigenous representation in the media and folks can keep updated on my work at http://www.johnniejae.com. DL: Hόόyíí! I'm Dr. Darcie Little Badger, a Lipan Apache writer and scientist. Thus far, I’ve published short fiction, comics, and research articles about toxin-producing phytoplankton. You can peruse my bibliography at darcielittlebadger.wordpress.com/my-short-stories/. It’s great to participate in a roundtable with such brilliant panelists (and moderator)! I look forward to our discussion. RR: We’re here to talk about Native American science fiction, but I want to tweak that term a little to encompass what I think is a broader term: Indigenous Futurisms. As you know, it’s a term coined by Grace Dillon, who was inspired by the Afrofuturisms movement, and encourages Indigenous authors and creators to speak back to the colonialism tropes so prevalent in science fiction by reimagining space exploration from an non-colonial perspective and reclaiming our place in an imagined future in space, on earth, and everywhere in between. What does Indigenous Futurism mean to you as a writer? And what makes it different from more mainstream science fiction? Do you consider your work part of Indigenous Futurism? EL: Indigenous Futurisms recognizes space-time as simultaneously past, present, and future, and therefore futurisms is as much about the future as it is about right now. 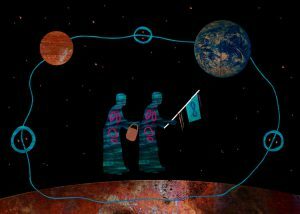 In my work, it means telling alternate histories, dreaming about liquid technology, imagining a future where unceded territories are taken back, and, ya know, space canoes. kimiwan’s zine issue, Extrapolation’s special issue, and RPM.fm’s mix-tape (https://soundcloud.com/rpmfm/indigenous-futurisms-mixtape) are all great projects that share what Indigenous Futurisms is all about. JJ: As a writer, Indigenous Futurism comes as naturally as breathing. It is in every story and article that we write because we have always understood the role that the past, present, and future play in every aspect of our realities. Unlike mainstream science fiction, where futurism is typically violent and values the advancement of technology over both nature and human beings, Indigenous sci-fi is the polar opposite. We imagine worlds where the advancement of technology doesn’t disrupt or destroy ecosystems or the balance of power between humans and nature. Even in stories where we are exploring alien worlds, we think about how we can co-exist with the life forms indigenous to that world. We think about the ways our cultures, languages, and everything that makes us who we are can be preserved and how they can evolve in these new worlds. As Elizabeth has mentioned, alternate realities are a huge part of our sci-fi because even if we’re not writers or artists, we all imagine how differently the world would be without certain events like colonization. DL: In order to explain what Indigenous Futurism means to me as a writer, I need to discuss my past as a young reader. Between kindergarten and twelfth grade, I devoured every YA-marketed science fiction and fantasy book in every library in every town I lived (my family moved often). Something began to bother me. My favorite books were missing a crucial element: people like me. The Native American characters I encountered were often stereotypical, like reflections in a fun house mirror. I felt frustrated. Invisible. Eventually, I stopped reading science fiction. It's hard to enjoy a future where you no longer exist. A book changed my life. Love Beyond Body, Space, and Time is a 2016 anthology of LGBT and two-spirit sci-fi/fantasy by Indigenous authors. It includes my story “Né łe” (the one about forty chihuahuas in space), so I received a review copy before the summer release date. I read the entire book in one sitting; the experience renewed a passion for speculative fiction that I thought I'd lost. It just takes one powerful work of art to combat a lifetime of disappointment and erasure. I was not alone. Publicly and privately, Indigenous readers reached out to me to share the joy that Love Beyond Body, Space, and Time brought them. Indigenous Futurisms speaks to our experiences, our souls. It is a celebration that we were, we are, and we will be. I certainly hope that my art contributes to such an important, empowering body of work. RR: One aspect of Indigenous Futurism is an awareness and embrace of Indigenous science, which is only radical because Western colonial culture discounts our cultures as primitive. It seems that every week there’s some new “discovery” by mainstream science that has Indigenous people saying, “Yeah, we told you so.” How does your knowledge of Indigenous science impact your writing? EL: I’ve seen this happen with blood memory and of course medicinal plant knowledge, among other science. Jumping back to Grace Dillon, she also talks about Indigenous scientific literacies, meaning the way in which science is shared through storytelling and art. Teachings are infused in Anishinaabemowin because phrases are relational and descriptive. Now, keep in mind that in the places she presents this, there will be people telling her, “Indigenous people don’t have science.” When that’s what we’re up against, I just don’t have the patience to wait around knowing it’s just gonna end in, “I told you so.” I’d rather just make my own work and hope that people get something from the experience. JJ: It goes back to representation and my knowledge of our indigenous sciences and our contributions to S.T.E.M was a driving force behind the creation of A Tribe Called Geek. We needed an outlet to celebrate our indigenerdity and change the narrative. Most folks are not familiar with indigenous people beyond the primitive “Hollywood” Indian and whitewashed history that has people believing that we were just sitting around and doing nothing prior to colonization. So, it’s hard for them to even acknowledge the indigenous roots and sciences behind many of these “modern discoveries." So, yes. It does influence my writing pretty extensively because representation matters. So, so much. DL: With toes in both Western-dominated academia and Indigenous science, I approach this question from a unique position. As I mentioned earlier, I have a PhD in oceanography and have published scientific papers using the mainstream research and peer review process. However, I am also working with the Lipan Apache education director to preserve our traditional knowledge, including insights about the cosmos, flora, and fauna. We even understood the behavior of red tides well before the term "red tide" was coined! Whether writing about Future Earth, distant galaxies, or fantasy worlds, I’m mindful that there’s no “right way” to learn about the natural world. Western science is certainly not universal. In my stories, characters - humans, aliens, whales with tentacles, whatever! - pursue knowledge in varied ways, and that's a beautiful thing! RR: At the recent 2016 New York Comic Con there were a record number of panels with diverse speakers and subjects, but out of the hundreds of speakers, not a single Native or First Nations panelist. Yet, in November, Indigenous Comic Con was held with two full days of programming about Indigenous SFF with all-Native and First Nations panelists, so it’s not like we aren’t here, creating. What’s going on? 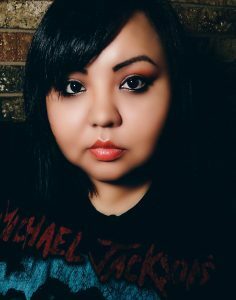 EL: I’m just really grateful we have the Indigenous Comic Con now where we can connect with so many amazing Native creatives from so many places. It’s all I ever want to go to. JJ: Ah, yes. The problem is that we have been rendered invisible by the hypervisibility of stereotypes and pre-conceived misconceptions of who Indigenous people are in a contemporary context. While we have wonderful indigenerds contributing and breaking through the glass ceiling of mainstream geek culture, we are still not seen as a target audience. So, we tend to get overlooked, even while they are trying to promote diversity. We all know that representation matters and how we are portrayed within the media, literature, movies, etc has a real-world impact. In this case, as Indigenous people, outside of the kitschy comic book characters, we have never been represented as geeks. The closest we have come to geek representation was Thomas Builds The Fire in Smoke Signals. So, it’s hard for people, even natives, to accept the reality that we can be and that we are geeks. We’re making progress. We are. It may not be enough, may not be coming quick enough, but we are. I know it’s hard to be patient for that floodgate of representation and recognition to open, but this is why we have Indigenous Comic Con. Being patient doesn’t mean we’re just sitting around and waiting. We create our own spaces and make our own noise. DL: I’ll tell you exactly what's going on: a rip-off! All those New York Comic Con guests were deprived a wealth of creative minds and comics. Fortunately, they can buy tickets to the next Indigenous Comic Con! It's so worth it. Though I couldn't attend in person this year (blame my dissertation), I acquired a Virtual Pass, and several of my Twitter pals shared pictures from the event. There wasn't a single boring panel (or moment) that weekend. The question still remains: why do big venues like New York Comic Con invite Ethan Hawke to talk about Apaches* but neglect actual Native American panelists? I suspect that our invisibility in popular media is a contributing factor. Mainstream comic publishers, including the giants DC and Marvel, have an abysmal record of Native American representation. I’m not just talking about fictional characters, either. I’m talking about writers and artists. I’d go on, but Johnnie Jae summarized my thoughts perfectly. Indigenerds are constantly ignored and overlooked. It’s a shame. That’s why Indigenous Comic Con is so, so important. *Ethan Hawke was a guest at NY Comic Con (2016) to promote his graphic novel, Indeh. In fact, he and artist Greg Ruth participated in an event titled, “INDEH: Native Stories and the Graphic Novel.” Described as a conversation about “the essential power of native stories in our lives today,” I’m dismayed that no Native storytellers were included as speakers. As Rebecca Roanhorse noted, we’re here, and we’re creating! RR: So much of mainstream SFF reads like colonial fantasy - conquering planets, hostile natives, the individual against the harsh terrain of a distant world. Even earth-based science fiction, like the new HBO series Westworld, seems to play out its future imaginings on the backs of Natives. How do we decolonize SFF? EL: Here’s the thing. I don’t want to take on decolonizing. I want to be sovereign. Sovereignty in media means self-determined work and collaborations with communities that are by us (if needed, with help from genuine allies who really listen), primarily for us. If everyone involved says it’s cool to share it with people outside of the community, great, it’d be cool if other people wanted to check it out, but I’m not going out of my way to make something accessible when I’m doing work like trying to pass on my language, come up with answers to toxins in the waters, and share intricate parts of plants and how they are used as medicines. My work is out there, thanks to more and more people stepping up with Indigenously-determined distribution. RPM.fm recently leveled up into its own record label Revolutions Per Minute, Lee Francis IV booted up the comics press Native Realities Publishing, and there are allies who are interested in truly uplifting Indigenous creatives. JJ: Hmmm. I don’t think it’s really about decolonizing science fiction but more about gaining recognition for native voices and a better understanding of how to respect each other’s cultural heritages. For the most part, the way that indigenous people and our cultures are written into the genre is pretty darn problematic. So, like Elizabeth, I think it’s of the utmost importance to support and collaborate with indigenous sci-fi writers and publishers because we know the boundaries of what is and isn’t respectful representation. DL: In my opinion, the only way to completely decolonize SFF is to publish and support Indigenous creators. This includes writers, editors, reviewers, publishers, and visual artists. I'll say it again for emphasis: publish and support Indigenous creators. Also? Respect Indigenous fans, particularly when we call out problems in mainstream SFF. We know ourselves better than anyone else. RR: I’ve heard (and agree) that Indigenous people have already gone through an apocalypse and are living our dystopian novel. How do we reimagine a more hopeful future? What would that look like? EL: When I look around me, I wonder what from now will still be in the future. Hopefully the continuation of my family. My skillets. That’s probably it. I want to see unceded territories discussed on an international level and reclaimed, our foods mostly being plants and animals and fish that are harvested, ways of converting toxic waste into energy sources implemented, sound frequencies to clean water applied, the cellular knowledge embedded in our language recognized, and bendable liquid technology utilized. Oh, and, space canoes. JJ: We have survived an apocalypse and with every generation our future continues to grow more hopeful. As we continue to preserve and reclaim our identities, traditions, languages, lands, water, resources, and values in the face of every new threat, the future looks more and more beautiful. As for what that actually looks like, I love Elizabeth’s vision, but I would like to add that I imagine that those future generations are no longer living in survival mode the way that we are now. I like to imagine that we have done our job, that we have sacrificed and done everything in our power to keep the wheels of healing turning that our future generations are well. I like to imagine that they are living without the feeling of urgency that we feel in every decision and move we make, that they are thriving and moving forward with calm deliberation. DL: I think that imagining a future, period, is a great start. Please, please, please give me stories that acknowledge we survived the 1800s. I've had my fill of Apaches in Westerns and historical fantasies, which is saying a lot, since Native American characters, even secondary ones, are so rare. Both in and outside fiction, we are pushed to the past tense. The reality is, many Indigenous cultures in North America survived an apocalypse. The key word is survived. Any future with us in it, triumphant and flourishing, is a hopeful one. RR: Do you think that Indigenous Futurism has a practical application to the larger world? Can it speak to the problems that are plaguing us right now, be it a rise in fascism, climate change, or anything else? EL: Writing and art, in whatever forms they take, are pathways to understanding and reflecting, with hope that they inspire. JJ: Absolutely, because it is a creative representation of the struggles that we face in our societies. The stories that we tell have tremendous transformative power. They stay with us and help shape who we decide to become, what we decide to do, and how we choose to move forward and create change in our realities. DL: It's difficult to overstate the importance of art, particularly as a world-shaping force. Actions and human behavior are driven by our beliefs, fears, memories, and values, and art informs them all. RR: Ku'daa and thank you so much! Elizabeth LaPensée, Ph.D. expresses herself through writing, design, and art in games, comics, transmedia, and animation. She is Anishinaabe, Métis, and Irish, living near the Great Lakes as an Assistant Professor of Media & Information and Writing, Rhetoric & American Cultures at Michigan State University. Her work can be seen at http://www.elizabethlapensee.com/. Johnnie Jae is an Indigenerd belonging to the Otoe-Missouria and Choctaw Tribes of Oklahoma. She is the founder of A Tribe Called Geek and she co-hosts its namesake podcast. She is a multimedia journalist for Native Max Magazine and she contributes to other publications like Native News Online and Complex Magazine. She produces and hosts/co-hosts several other podcasts: Indigenous Flame, commUNITYTalks and SNAG’N. She is also a co-founding board member of Not Your Mascots and LiveIndigenousOK. Most of the work that she does is centered around Indigenous representation in the media and folks can keep updated on her work at http://www.johnniejae.com. Very smart, very beautiful work. Thanks, all.